Periodontal disease is a condition that worsens overtime and leads to inflammation of the gums, bone and gum tissue recession, and loss of teeth. This is why it is so important to treat periodontal disease. One of the treatment methods recommended by Dr. Trujillo, an Arizona periodontist, is pocket irrigation surgery. Take a moment to learn more about pocket irrigation surgery and how it can benefit you. Pocket irrigation surgery can benefit the majority of patients who receive regular dental cleanings. What is Pocket Irrigation Surgery? Is Pocket Irrigation Surgery Right for You? Interdental Cleaning: Pocket irrigators when used properly will remove the debris, foot particles, and plaque from between your teeth which keeps your gum pockets shallower and cleaner. Halitosis Prevention: Bad breath is usually a result of old food particles stuck between your teeth. A pocket irrigator can help eliminate this by flushing out the food particles. Subgingival Cleaning: The rounded tip on a pocket irrigator can eliminate any risk of damaging tissue while still cleaning under the gum line. You can flush out toxins, particles, and bacteria this way. 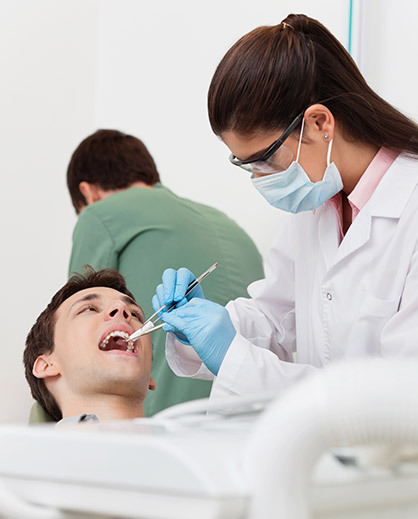 Antimicrobial Application: This part of the procedure is ideal in preventing and eliminating harmful oral bacteria. It can be used by itself or with water as part of the treatment process. How is the Procedure for Pocket Irrigation Surgery Performed? Normally combined with a pocket reduction surgery or a professional dental cleaning, pocket irrigation surgery is a deceptively simplistic procedure. For the irrigation portion of the surgery, a tool is utilized to either use a antimicrobial solution, water, or a combination of the two to flush out the gums and teeth. Similar tools like these can be purchased for use at home and come with different settings and ‘heads’ to utilize for different situations. Pocket irrigation surgery is an excellent procedure that is designed to treat periodontal disease by cleansing plaque and bacteria from your mouth while issuing an antimicrobial agent. Arizona Perio Group’s staff is available to take any questions you have regarding our services or on pocket irrigation surgery. If you would like to make an appointment today for pocket irrigation surgery or any other dental service offered by Dr. Trujillo, then you can do so online or by phone! Our team is proud to help the greater Phoenix, AZ, area with their dental needs!